NEWPORT BEACH — The only full-sized replica of the first yacht to win the America’s Cup international sailing trophy pulled into Newport Harbor and docked onto an end-tie at Bahia Corinthian Yacht Club on July 9, a few hours ahead of a scheduled public viewing for Orange County’s sailing enthusiasts. This version of America is actually the second of three replicas ever built since the original was scrapped in 1945. Troy Sears of San Diego currently owns the replica, purchasing America nine years ago and taking the 20-year-old sailboat on a two-month tour along the West Coast. The tour began a few days earlier at Silver Gate Yacht Club in San Diego and made its first official stop in Newport Beach, where sailing fans had a two-hour window to view America on July 10. 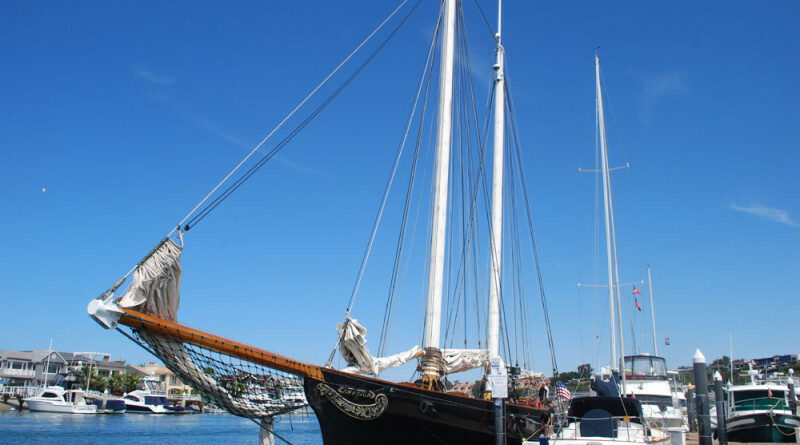 Sears, who lives aboard America, said the replica would continue up the coast to yacht clubs in Central and Northern California, en route to its final planned destination in Seattle, Washington. A stop in Vancouver, British Columbia, though uncertain, could be in store. The tour, once fully realized, would help America’s Cup gain some exposure and give Sears a chance to educate the public about sailing and yachting. The message, according to Sears: Sailing and yachting are not activities limited to a select group of individuals but instead a pleasurable experience for everyone. Still, Sears’ intent holds true: Yachting is not an elite or exclusive activity but something to be enjoyed by as many people as possible. The San Diego area resident, accordingly, hopes to use America to spread education about the yacht – and America’s Cup – as he navigates from Southern California to the Pacific Northwest. Spears specifically said he hoped to open a dialog about sailing with anyone and everyone willing to lend an ear. Part of the dialog, which Sears said was endorsed by America’s Cup, would shed light on the original America, which sailed from 1851 to 1942 and was the first recreational vessel to successfully cross the Atlantic Ocean. The original America launched May 3, 1851, and won a 53-mile Royal Yacht Squadron regatta at Isle of Wight in United Kingdom about three months later. She was briefly re-named Camilla in 1856 before reverting back to America six years later. The schooner, which had a 22-foot-10-inch beam and overall length of 101 feet and 3 inches, was originally owned by John Cox Stevens. A storm destroyed the schooner in 1942. About three years later, America was scrapped. America owned by Sears was built in 1995; the first replica, also named America, was built in Maine in 1967. A third replica, Skythia, was built in Germany in 2005. Sears’ America will also be used to promote the 2017 America’s Cup, which will take place in Bermuda.